in 7 sts x 1"
One Size, Height of Thumb and Hand easily adjustable. 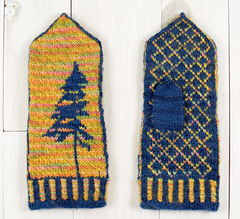 Knit in the round, these mittens are worked in the Fair isle Method. The tree itself is the tree from our cottage which really is an iconic part of our view of the lake. We experience epic sunsets from our deck, and these mittens were designed to reflect those lovely evenings spent with family.